Posted On Tue, 11 Jul 2006 07:43:00 +0000. Filed in mountaineering. By Vaibhav Bhandari. At the ridge Originally uploaded by vbha. 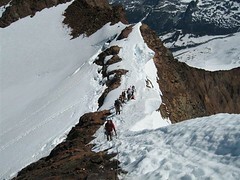 The weekend of July 4th I did the Sahalee peak climb through Quien Sabe glacier. It was such an awesome day, my most scenic climb so far. We slept under the huge and threatening Johanesburg mountain and then hauled about 12 hour day to complete the glacier climb, the last portion of it was a class 3/4 scramble. In this picture I’m traversing a very narrow and exposed ridge making way towards the last pitch! I was holding my breadht - dont fall, dont fall dont fall!! But hey now i’m Mountaineers Basic graduate!! hurray I have completed all my required alpine, glacier and rock climbs! !